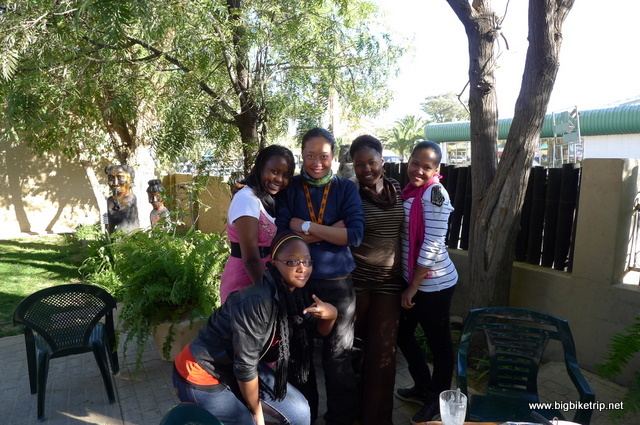 We were now truly in Africa, so it seemed. 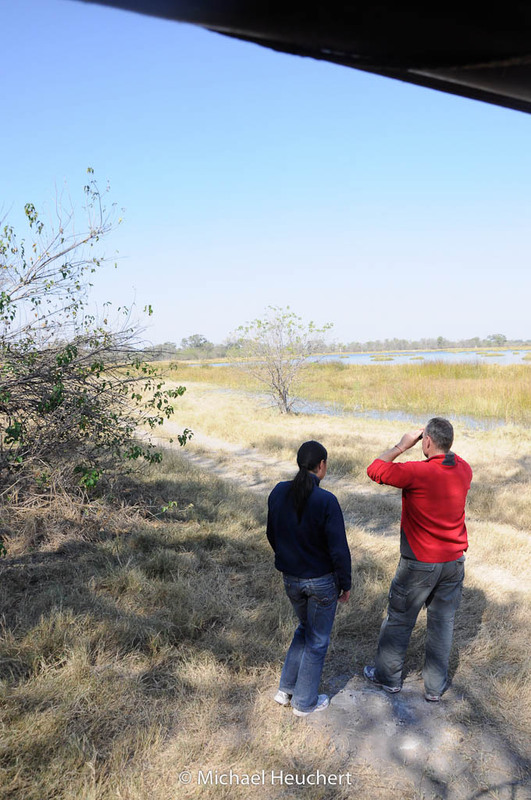 The landscape had changed to classic bush colours and there were many signs warning of African animals that threatened to leap out onto the road. If that meant donkeys, goats, cows, dogs, human boys and yellow hornbills then that was true. We decided to stick as much as possible to the tarmac roads, even though the routes were a bit longer, the traffic a bit heavier and the scenery not so interesting, but Fanny needed to get her confidence back after her big crash in the Namib desert and start getting some solid hours in the seat… although I feared riding at 100 kph along a straight tar road was not steepening the learning curve enough. That said, our expedition was all about the joys of riding excellent motorcycles in interesting and wonderful places and that was what we were doing. 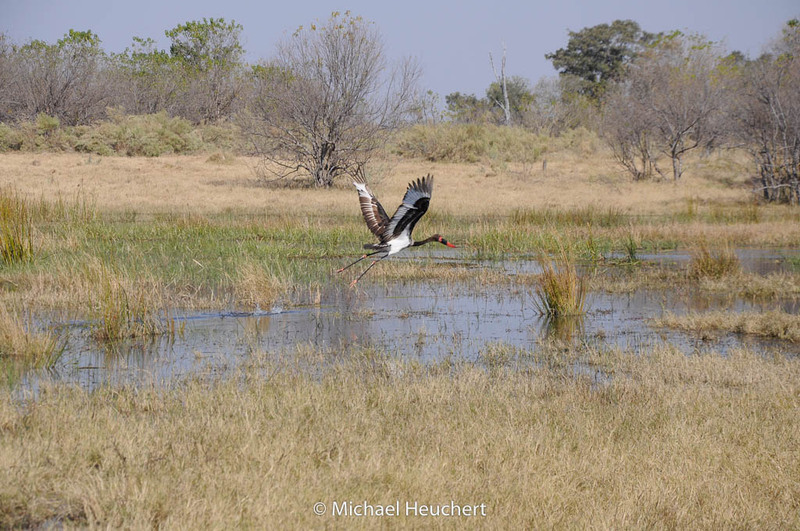 We would overcome the challenges ahead all in good time, and so it was with a great sense of achievement that we arrived in Maun, the gateway to the magnificent Okavango Delta. 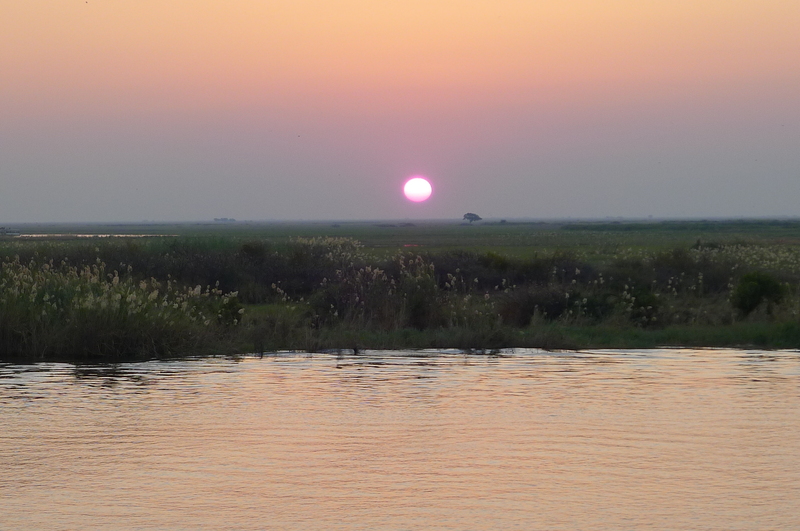 Geographically the “river that never finds the sea” disappears into 6,000 square miles of lagoons, channels and islands and is the largest inland delta in the world and absolutely teeming with life. 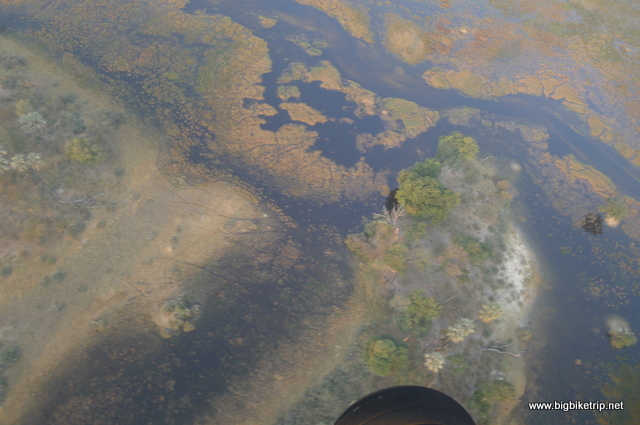 Two million tonnes of sand and silt flow into the system from the highlands of Angola and the 2 % that doesn’t end up in lake Ngami or 300 Kms across the Kalahari in Lake Xau and Makgadikgadi remains in the delta to make a truly magnificent oasis in the desert, the Okavango Delta. 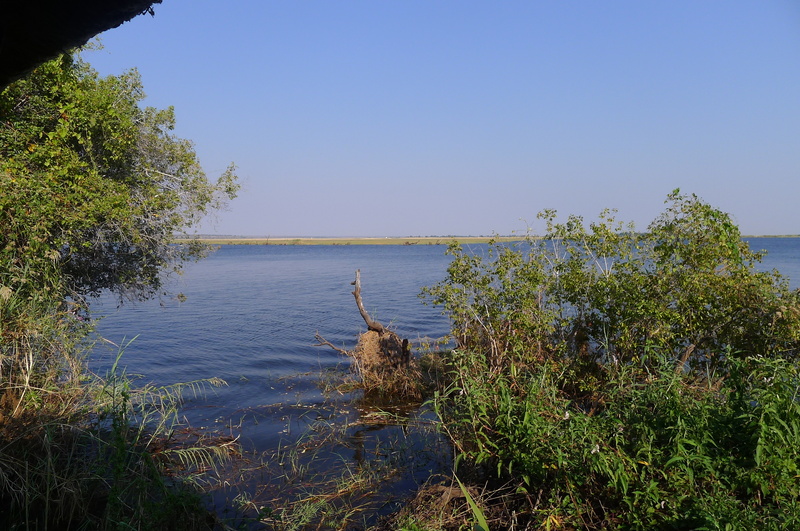 Inhabiting the delta are 35 million fish (allegedly) of almost 80 species, the most abundant being a type of Bream that the crocodiles regularly feast on. 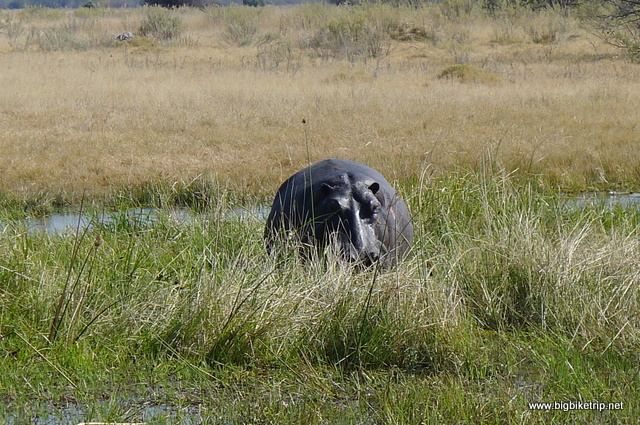 Hippos flatten paths through the papyrus on their nocturnal forays to graze and this creates more channels and paths for other animals such as situatunga and antelope. 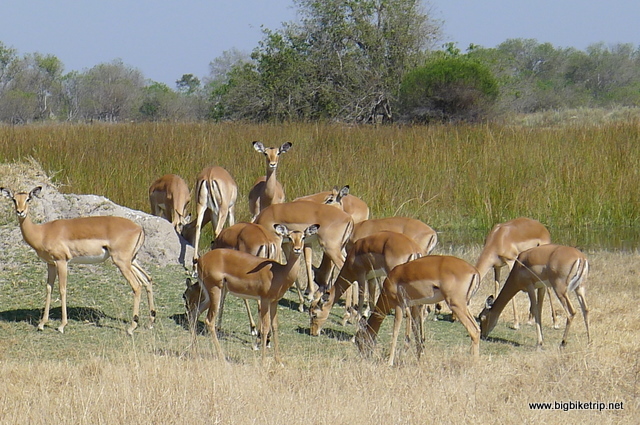 There is an abundance of Impala, described by the locals as “Big Macs” as they form the diet of many of the predators such as lion, leopard, cheetah, hyena and wild dog. The are a huge number of elephants and giraffe and other grazers include buffalo, wildebeest, kudu, sable, roan, waterbuck, and the fastest antelope in world the Tsessebe. 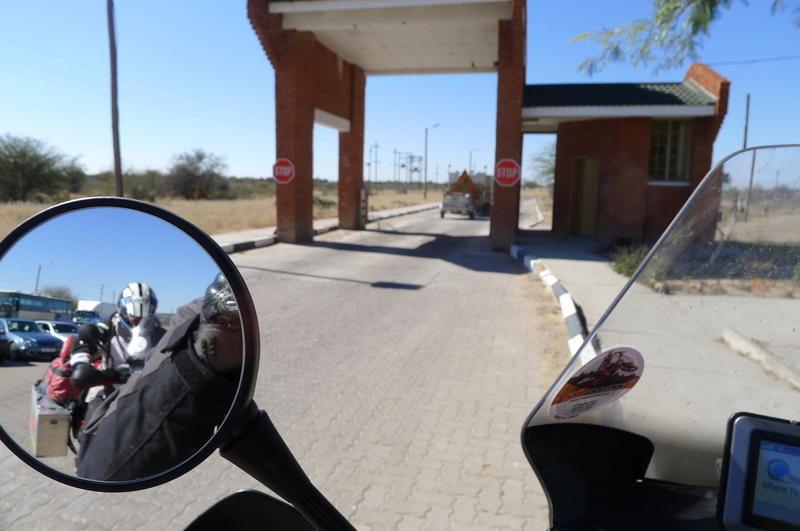 Border crossing from Namibia into Botswana… very easy and quick. 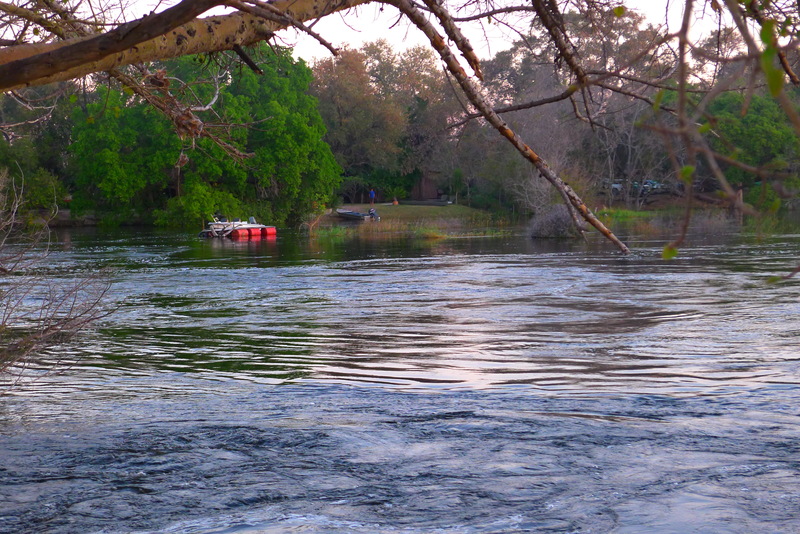 We went on safari with two Canadians, Matt and Michael. Michael who took some of the following pictures is a keen and talented photographer, and with his funky camera took much better pictures of the wildlife we saw whilst in the Okavango. A big boy .. or is it a girl? It is very big. 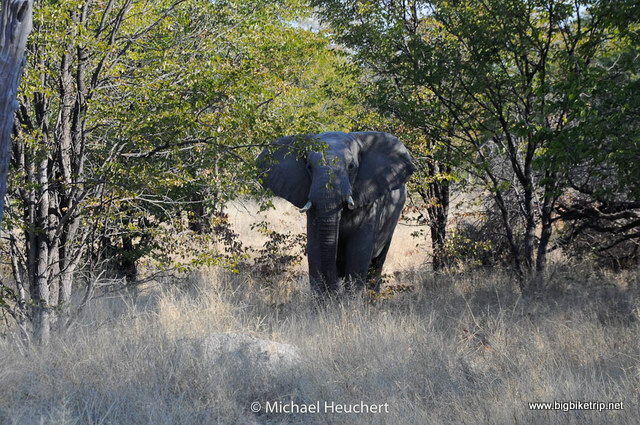 This elephant just appeared out the bush.. it was not actually in the park but on the road to the park. 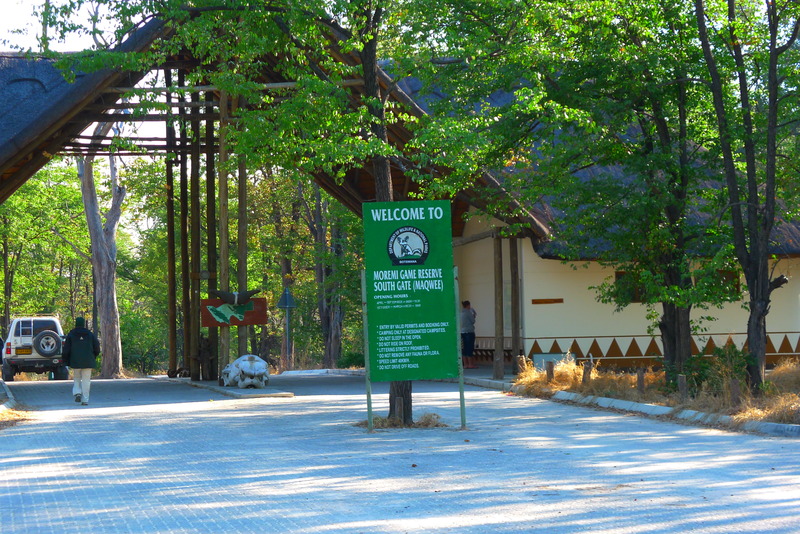 We would see a lot more in Botswana. 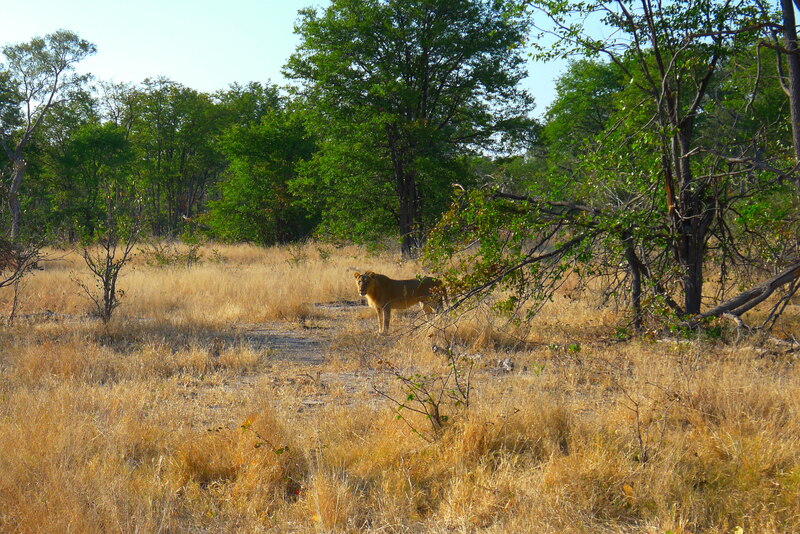 This lion was outside the park as well. We might as well have stayed outside and saved the entrance fee. Ah yes…. 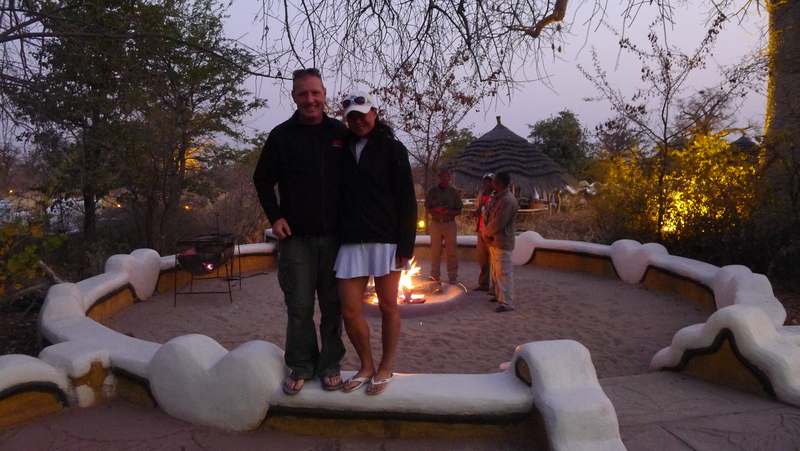 the rare lesser spotted Fanny … look out for those lions…and snakes ….and scorpions!! 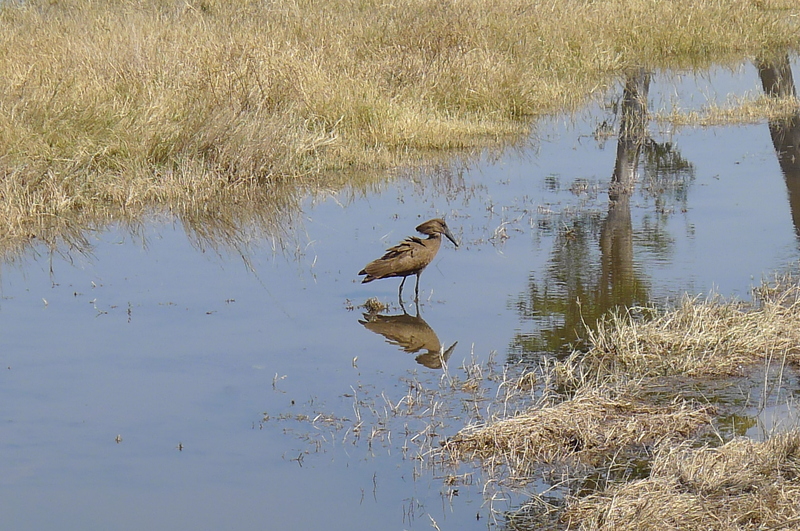 A Hamerkop waiting patiently to catch a fish … which it did. One of the joys of camping in the bush is getting a big fire going and sitting around it and gazing at the flames (bush TV ). We became very accomplished firemakers. It seemed to be a very popular staging post for safaris, Mokoro expeditions (dug out canoe safaris), walking safaris, bush camps etc… We did a one day safari and teamed up with Winfred, a forester from Bavaria and Matt and Michael (of Michael Heuchert photography fame ) from Calgary, Canada who were proving anything could be done by traveling through Africa and exploring the bush less traveled in a two wheeled VW polo. It is true, the best offroader in Africa is a hire car…don’t tell Avis. 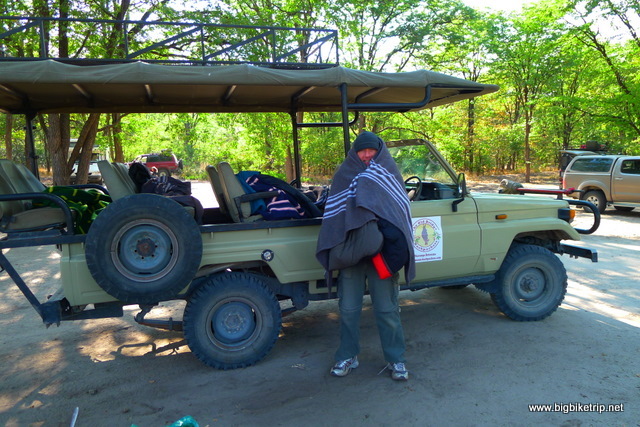 Little did we know that our safari, which started very early, would take 100 bumpy kilometers just to get to the entrance of Moremi Game Reserve, nor that we would all be absolutely frozen in an open top game viewer the whole way. Everyone laughed at me for insisting that Fanny and I take our sleeping bags with us on the gameviewer, but I think we had the last laugh. We were all chilled to the bone and it took two hours after sunrise for the temperature to become tolerable. 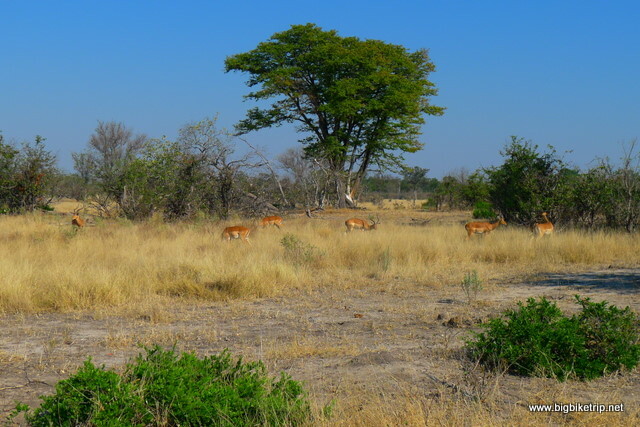 That said even before we hit the game reserve at the centre of the Okavango Delta we saw plenty of elephants, lions, impala, hyena and impressive kudu. All the game we saw in the park looked beautiful and we were fortunate to see so much wildlife, but I guess I have been lucky and seen quite a lot of the Big 5 (Elephant, Buffalo, Lion, Rhino and Leopard) in my life and now my interest lies much more in the diverse flora and bird life across Africa. 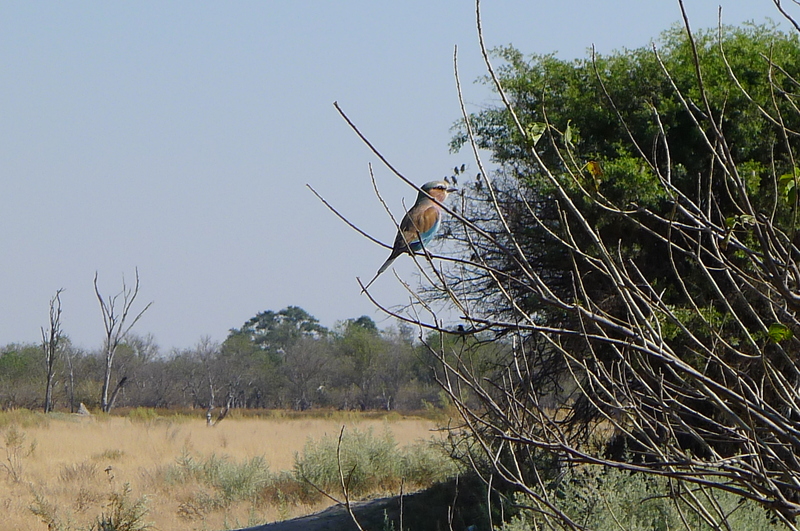 I am a bit of an amateur twitcher and take as much pleasure spotting a Lilac Breasted Roller as a Hippopotamus. 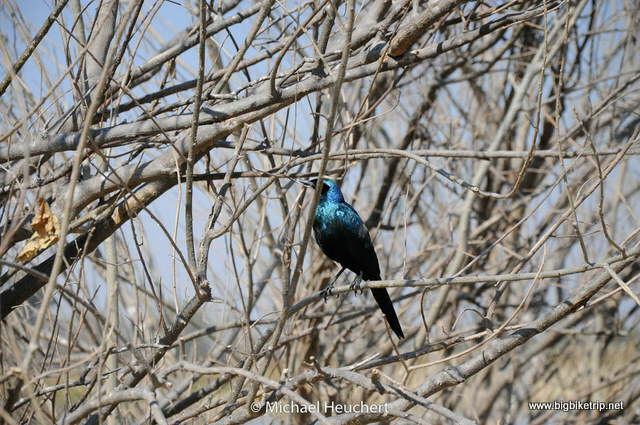 I have lots of wild life and bird books at my home in Arniston on the southern tip of Africa and enjoy recording sightings and researching the various and fascinating birds I have seen on my travels in Africa. Throughout the trip, when I wasn’t looking in my mirrors to see if Fanny was still behind me, my head was constantly turning left and right as I scanned the trees and bushes. 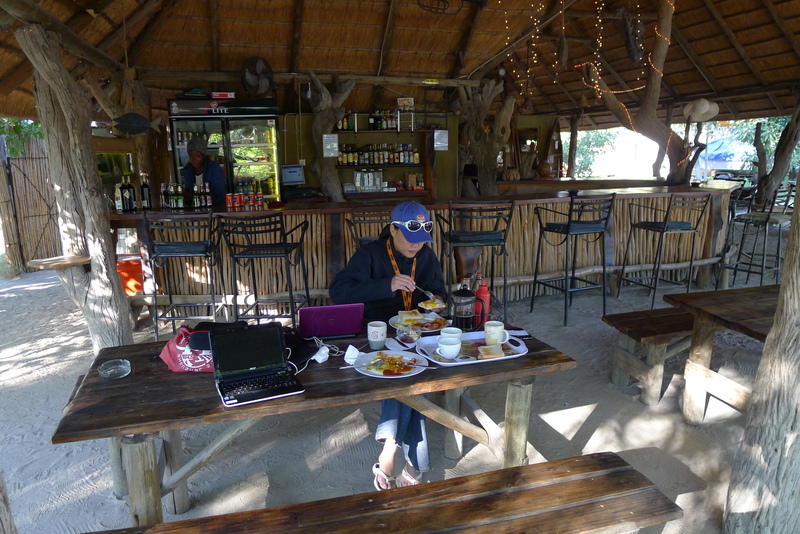 Fanny and I having breakfast and doing our homework at Old Bridge, Maun. 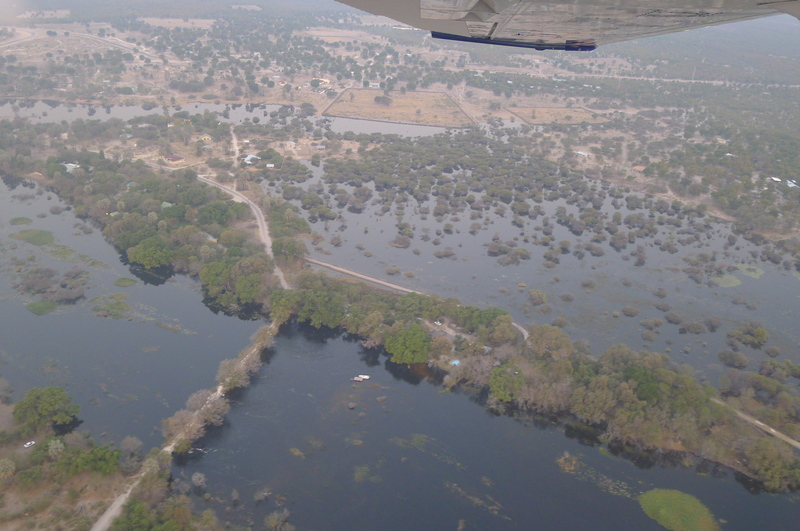 The next day we decide to splash out on a flight over the Delta in a light aircraft. 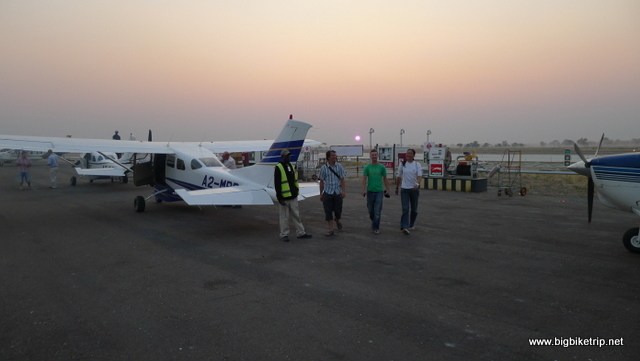 Maun has a lot of flight operators and again we teamed up with Winfred, Matt and Michael and had a sunset flight with Major Blue airlines, piloted by Andrew. Sadly aerial photography requires some skill and special equipment, none of which I have and so I took lots of blurry pictures of black dots on greeny grey backgrounds that were allegedly animals. Also one tends to expend too much time looking for creatures and shouting out ” Lion” or “Elephant” and too little time trying to focus the camera. By the time the camera was actually focused on something other than the perspex of the cockpit we had usually flown over our photograph target. 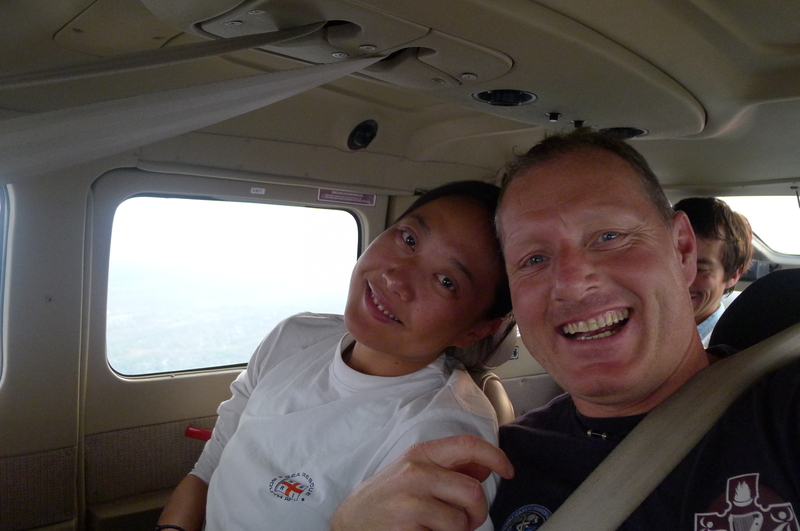 It was however a truly magical landscape and it was a privilege to see it from 400 feet. Highly recommended, especially at sunrise and sunset. 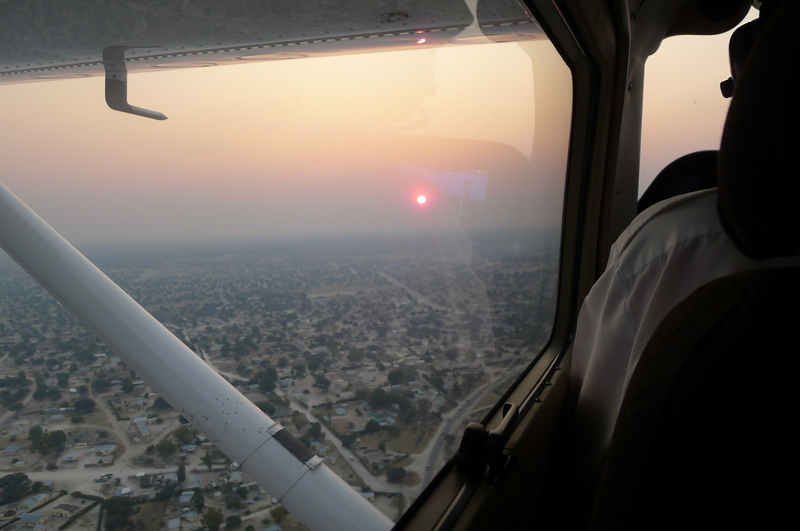 Going for a sunset flight over the Okavango Delta. Can you see the wildlife? …. 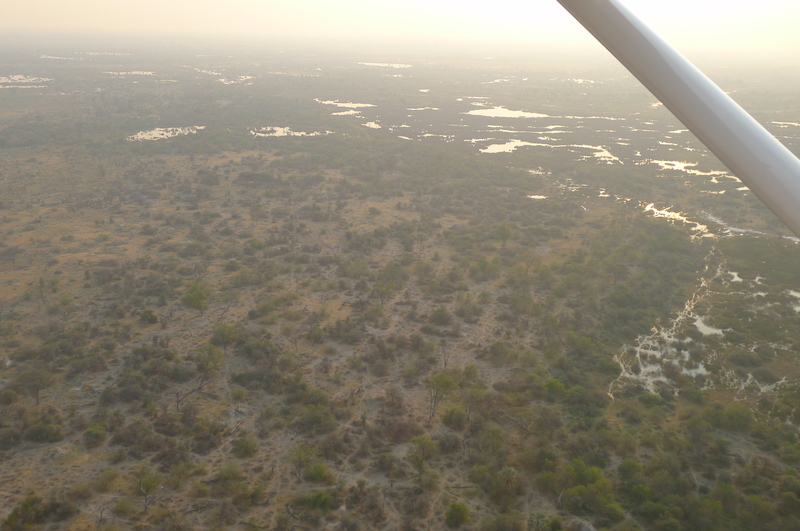 Maybe a giraffe or an elephants… but very difficult to take a picture from an aeroplane. 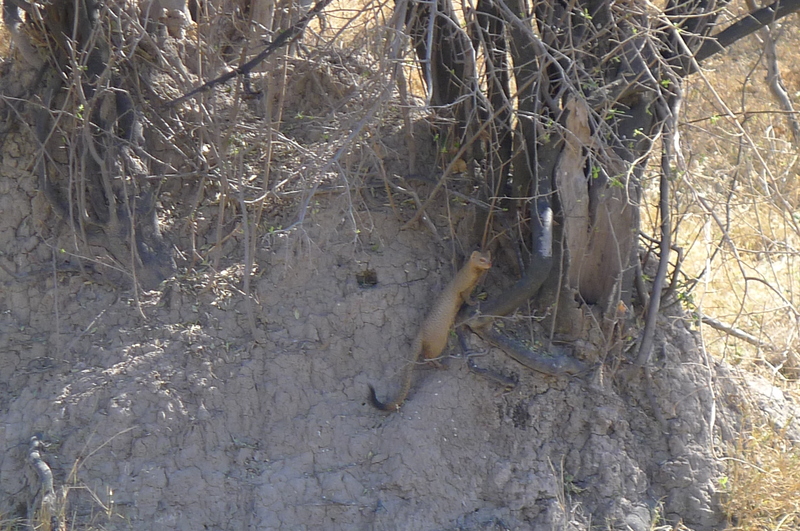 Look at that Banded Mongoose down there. Our campsite at Old Bridge from the air.. you can actually see the KTMs and our tent if you look hard enough. Fanbelt and myself back at camp with Michael, Matt and on the right, Winfried who we will meet up again with at his home in Bavaria, Germany much later on in the trip. The young travelers we met in backpackers and campsites along the way often sat in the bar during the evening drinking beer and seemed to be fully absorbed with their facebook and computers. 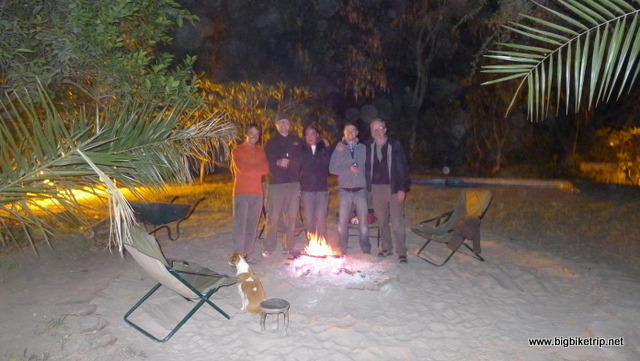 We older travelers also drank beer, but preferred to sit by the fire and chat with each other. The generation gap, huh? 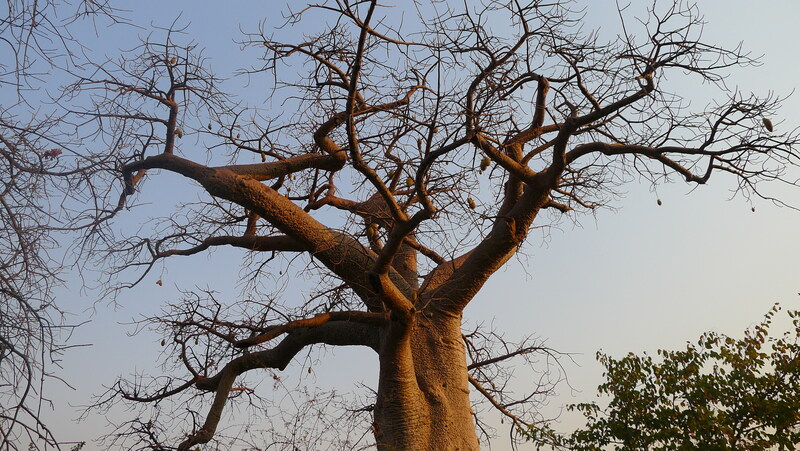 Some of these baobab trees are thousands of years old. Big Fire at Planet Baobab. 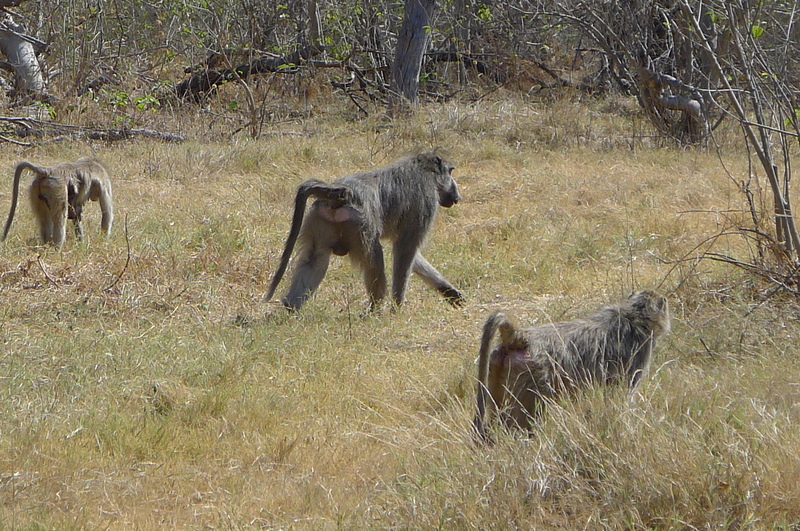 We saw a lot of baboons everywhere. Later at our campsite on the slopes of Mount Kenya a blue baboon and his troop raided our tent. A blue baboon isn’t a sub- species of baboon, but rather a very naughty alpha male Kenyan baboon that was spray painted blue and had a bell put around his neck by the Kenyan locals because he was a recidivist thief. 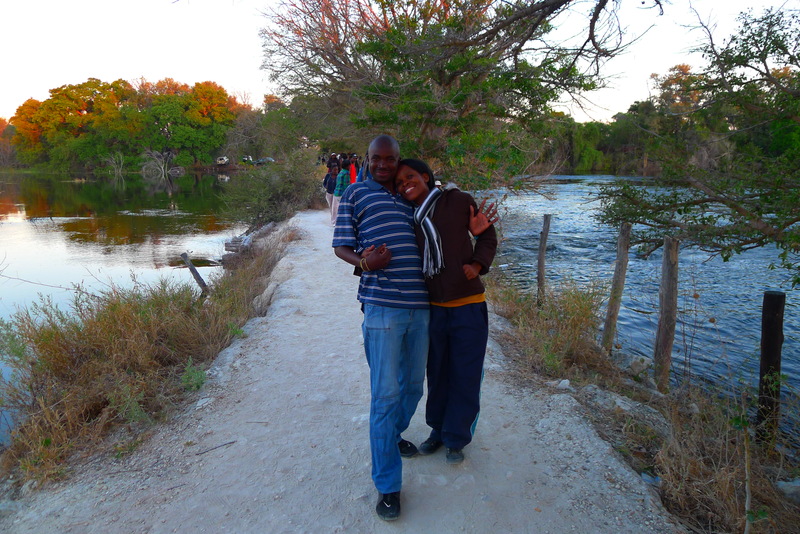 Still cold at Moremi Game Reserve. I did bring our sleeping bags and was still freezing until at least 10 a.m. There were as many animals to see outside the park as there were inside. 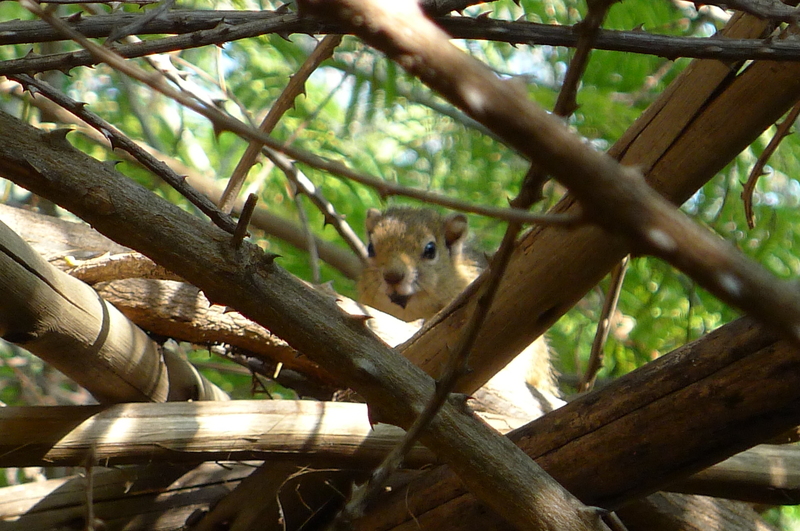 Yes… we are looking at you. Something’s been here. 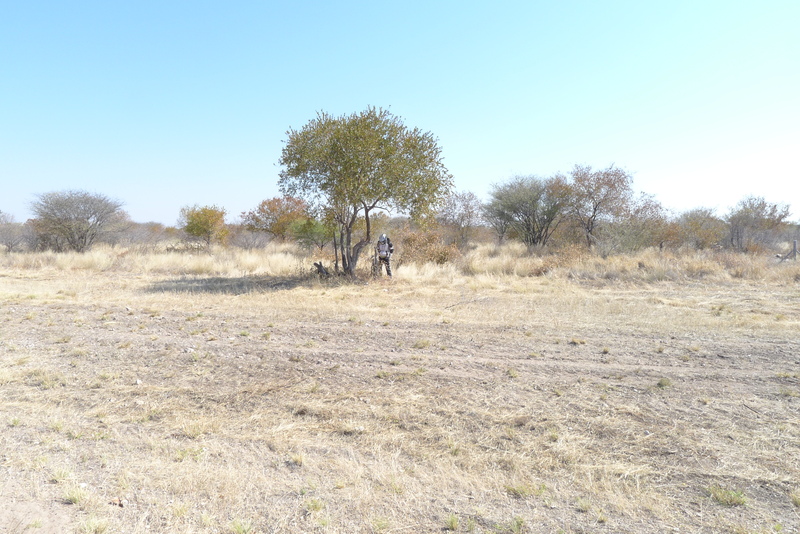 In fact we saw leopard prints outside out tent in Botswana, Namibia and in Kenya. I think these are lion prints though. Luckily we never saw any of these outside out tent. I don’t think!!! 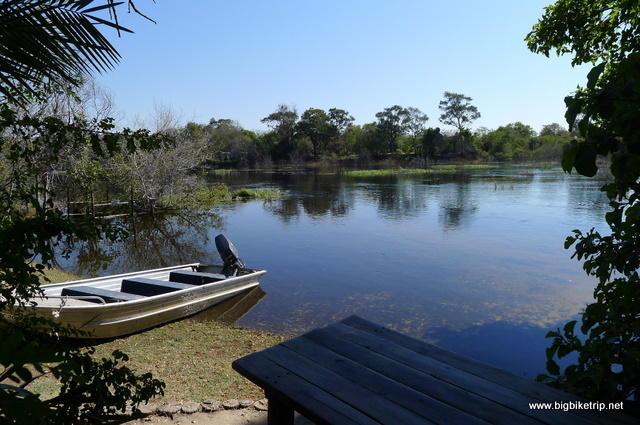 After a relaxing and enjoyable few days at Maun we headed north east towards the Zambezi River that separates Botswana from Zambia. 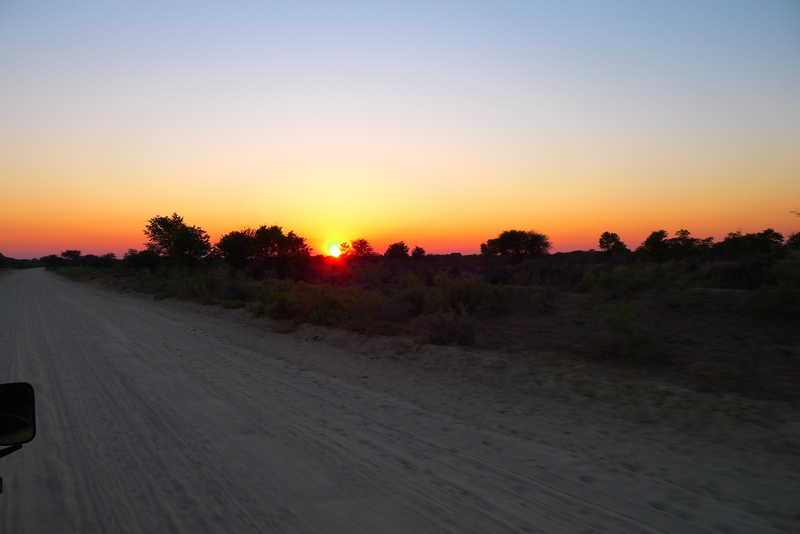 This was quite a long stretch of riding through amazing bush lands that surround quite a few national parks on the east of the Okavango. 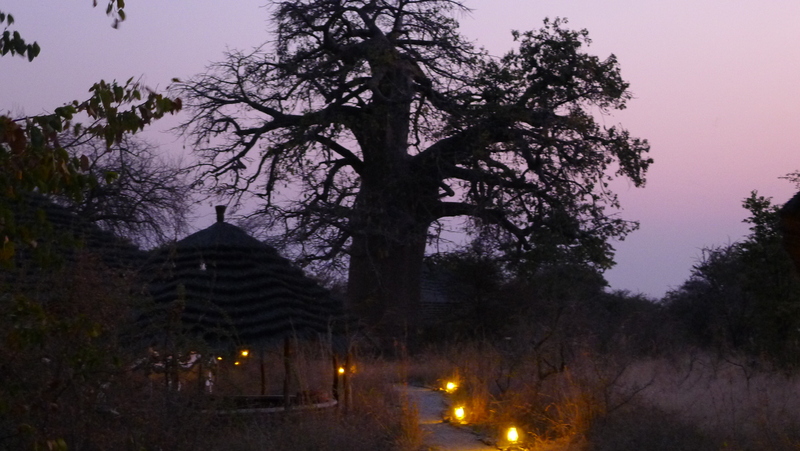 We camped along the way at some superb places, one of which was called Planet Baobab and is beautifully set among hundreds of Baobab trees, many of them thousands of years old. 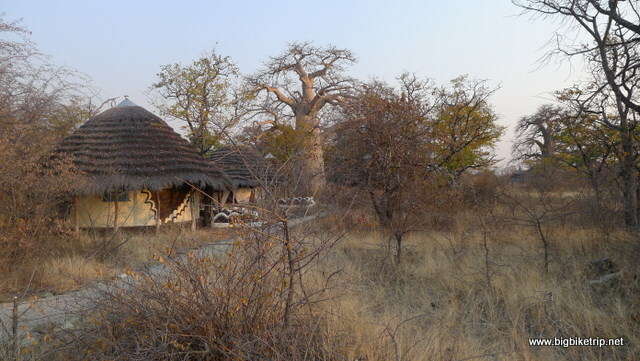 Planet Baobab not only had very reasonably priced campsites, but also some quite luxurious lodges and chalets set among the baobabs and well tended gardens. 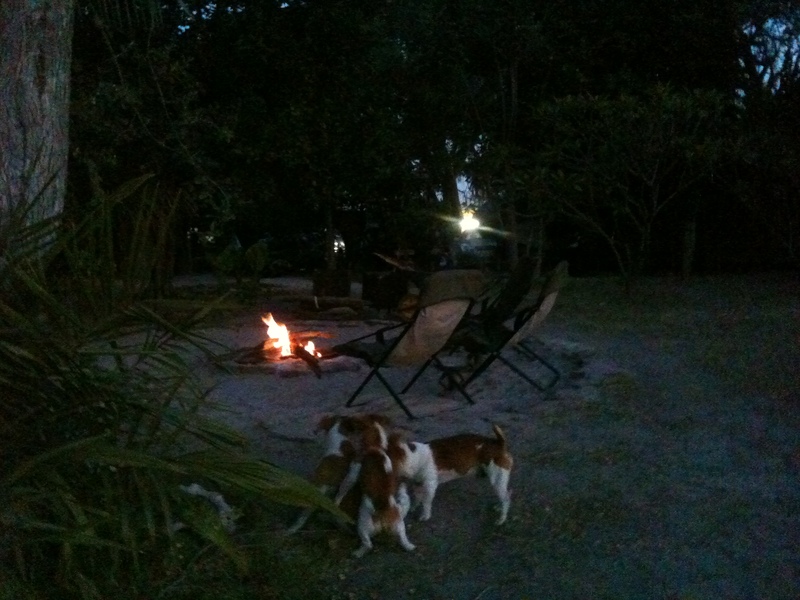 As always, there was a great bar and a huge fire place around which the guests could relax, eat good food and drink. It was also a popular stop for the overland trucks and their young travelers. 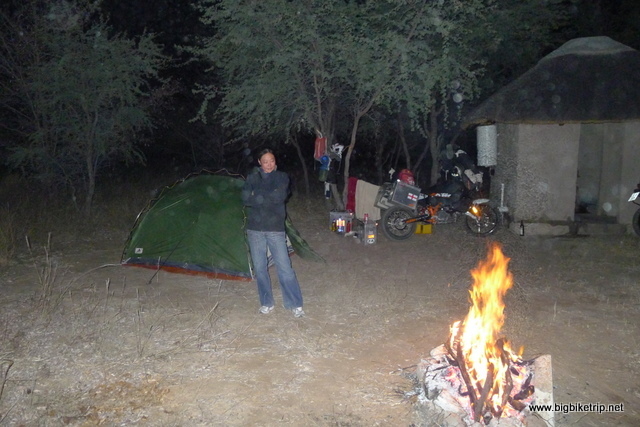 Quite a good way to see Africa and this must have been one of the more popular campsites on the overlander itinerary. Fanny and I had pitched our tent on sand and in the morning we noticed paw prints circling our tent. 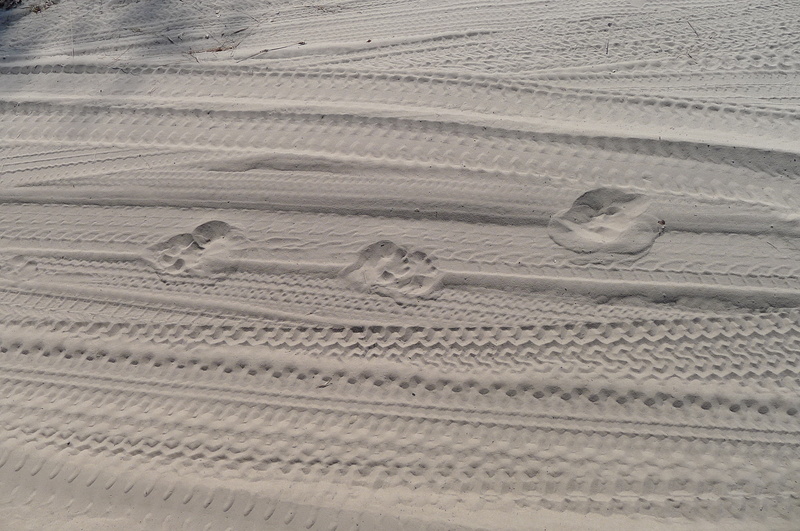 I asked one of the local guys what animal they belonged to and was rather startled and quite excited to learn they were leopard paw prints and that we had had a nocturnal visitor. We were told there were actually a lot of leopards in the area, but that they were very stealthy and quite shy of humans. I asked if it was dangerous and whether they would attack humans and was not entirely reassured with the answer, “Not usually”. 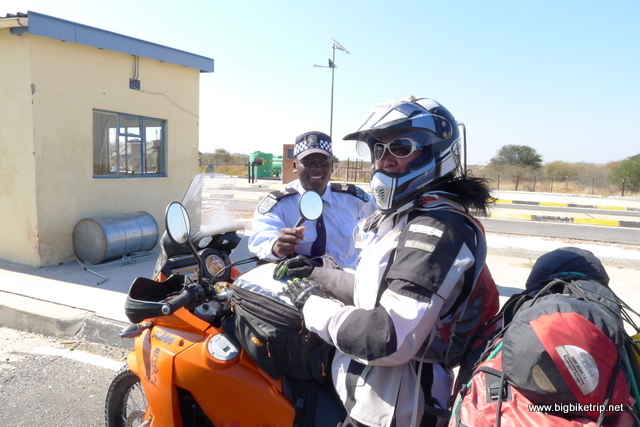 We had now crossed Botswana from the Kalahari in the west and were not far from the border with Zimbabwe in the east and now planned to ride northwards to Zambia. We had been told by nearly everyone we met that the roads were bad, and I suppose they were, but our KTMs had no problem making progress along overladen truck destroyed roads that were reduced to gravel, sand and huge potholes. 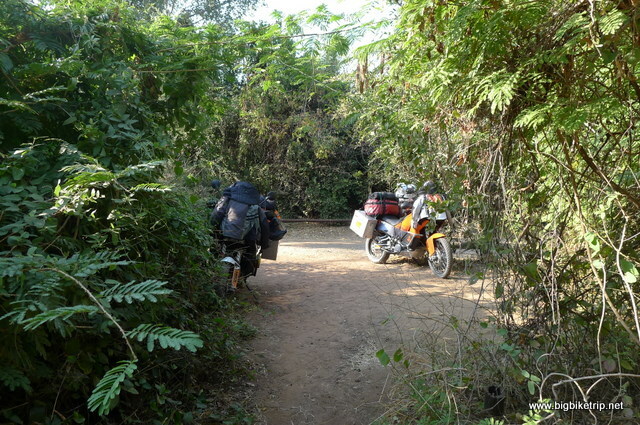 A particularly long stretch that actually went through a game park was described by many 4×4 drivers we encountered as particularly bad, but our bikes were made for such surfaces and had no problems at all. For some reason our four wheeled cousins were having a bad time of it and we saw many broken down vehicles, and on one particular occasion a South African “bakkie” that had been towing a trailer tent upside down with all the contents of the trailer strewn about. We saw the occupants sitting by the side of the road and stopped to ask them if they were alright. 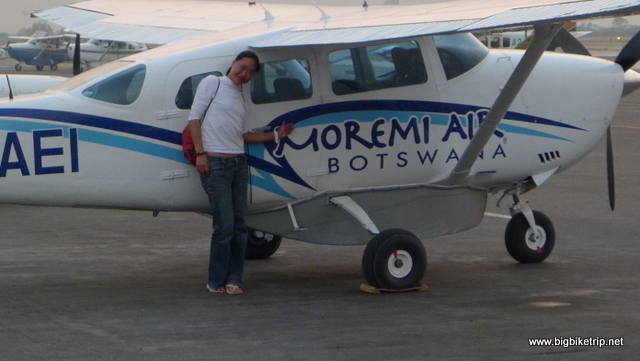 They were, but a Botswana ambulance arrived shortly afterwards and also some park rangers. I suppose it would be bad luck to survive a car crash in the bush and then get eaten by the local wildlife. Judging by the extensive damage to the bakkie and the complete destruction of the trailer tent it was probably the end of their own particular expedition. We actually saw quite a few accidents involving 4×4 vehicles on our trip through Africa, and I would venture the cause in most cases was because they were driving too fast on gravel surfaces or suddenly hit huge potholes and lost control. Often they rolled their vehicles causing serious damage and occasionally serious injury to the occupants. Given all this we still saw far too many 4×4 cars driving too fast and taking too many risks. Like motorcycling it takes experience and skill to rally race on sand and gravel. For us on our “off road” orientated motorcycles it was much easier along this stretch of road because we simply weaved between the huge potholes, rode over obstacles, skimmed across corrugations and could squeeze along narrow tracks by the side of the road when it was very muddy or very gnarly. There was actually a new road being constructed in places and often we would ride up the steep embankments and between the traffic cones and ride along new and pristine tarmac before it had officially opened and thus make good progress and keep out the way of the trucks and other traffic. When we came up to the sections of road construction with heavy plant equipment we just rode on the grass or the verges and managed to easily bypass any traffic jams or obstructions. 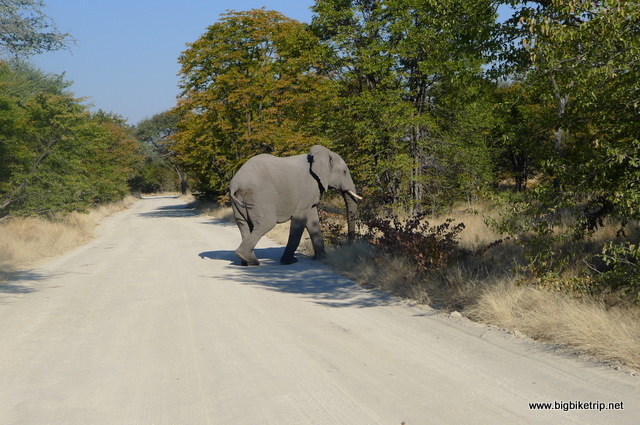 It was also along this stretch of road we ran into dozens of elephants, some by the side of the road pulling branches off the trees, some plodding across the road, but more often than not just standing in the middle of the road looking at us. If they didn’t get out the way we just rode around them. It was at times like that we really appreciated just how lucky we were to be here, riding our bikes in beautiful Africa. 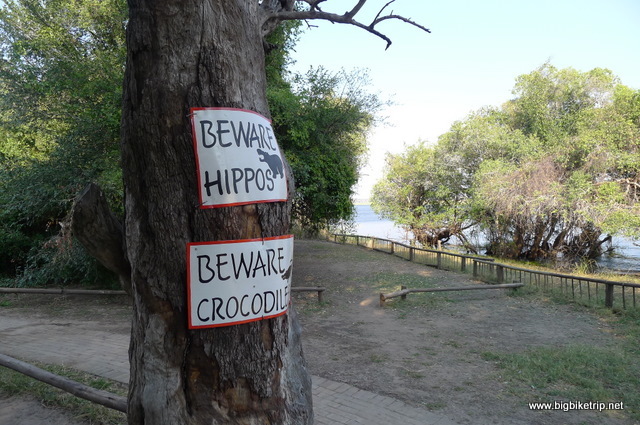 Our last camp in Botswana was in Chobe and we pitched our tent right next to the Zambezi River and next to signs warning about the creatures that make the river their home. 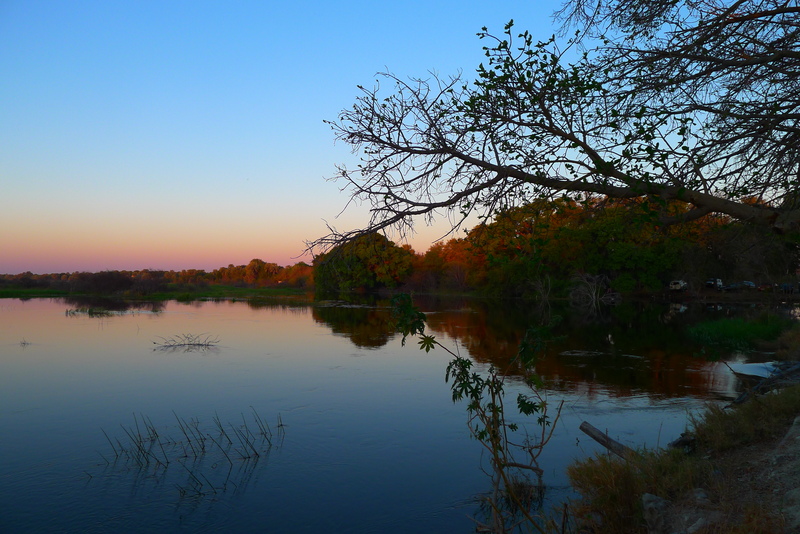 Years before, I camped on the banks of the Luangwa River in Zambia, but perched seven or eight meters on a platform up a tree, safely away from the hippos and crocodiles that came out at night. This time we were on the ground, although with a lot more people. 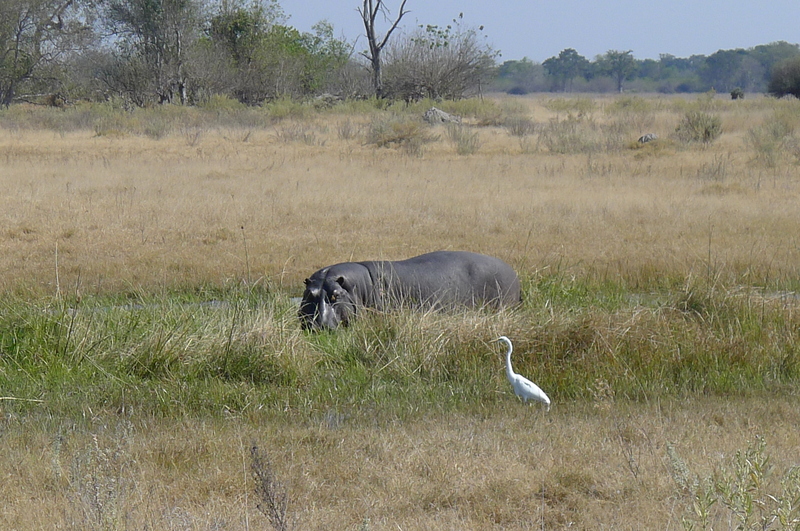 Like many in Botswana it was a good campsite and we were kept amused by the commotion caused by hippos and other creatures regularly jumping into the swimming pool and scaring the guests. 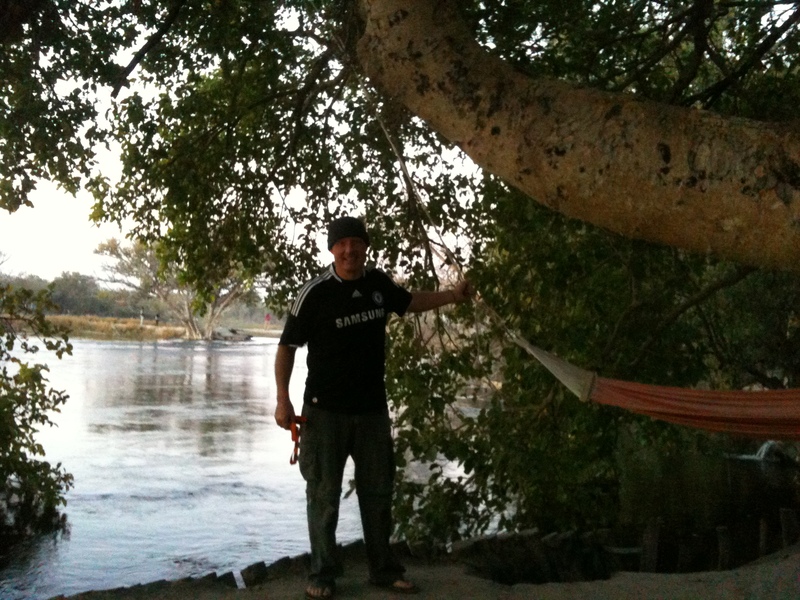 The next day we packed up early, fueled up our bikes and crossed the river by ferry boat into Zambia. Country number 4. After you, Sir……… or is it Madam. 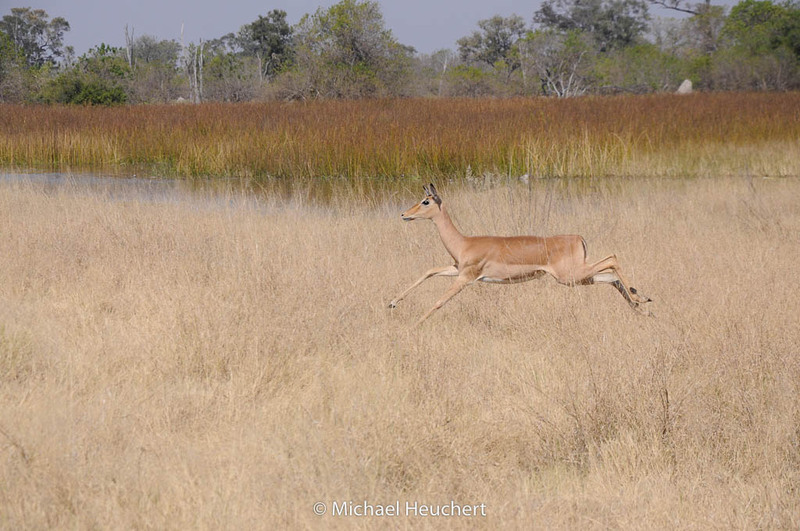 Impala … beautiful coats. 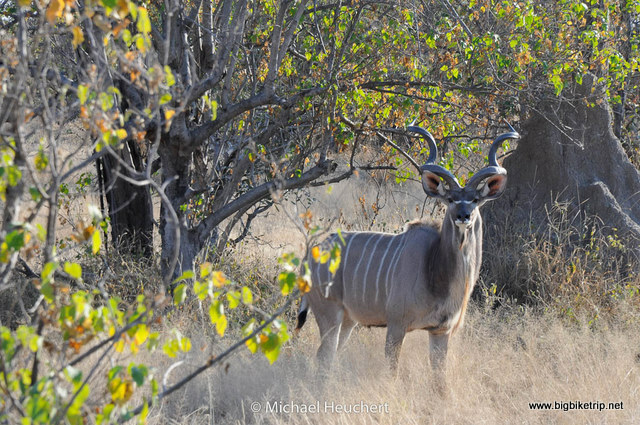 This lovely picture was taken by Michael Heuchert from Canada with whom we went on safari. Better camera than ours and more importantly much more talent. Do you ever get the feeling you are being looked at? 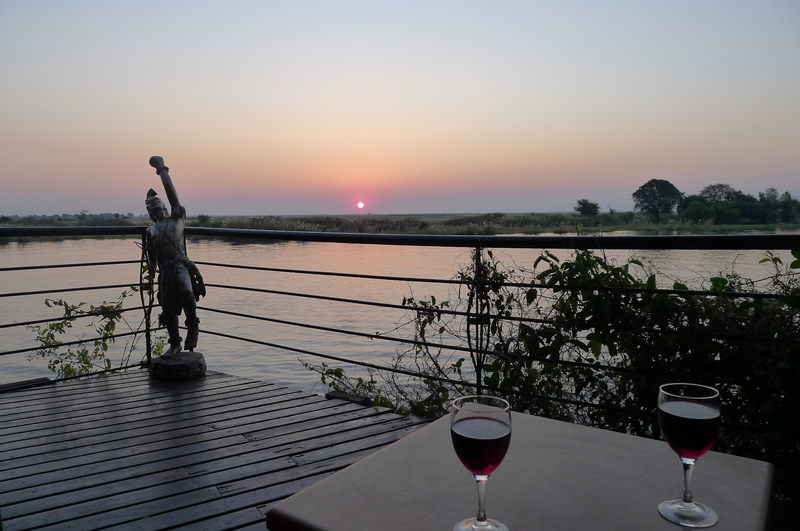 Sundowner with Fanny on the banks of the Zambezi… raaaah! 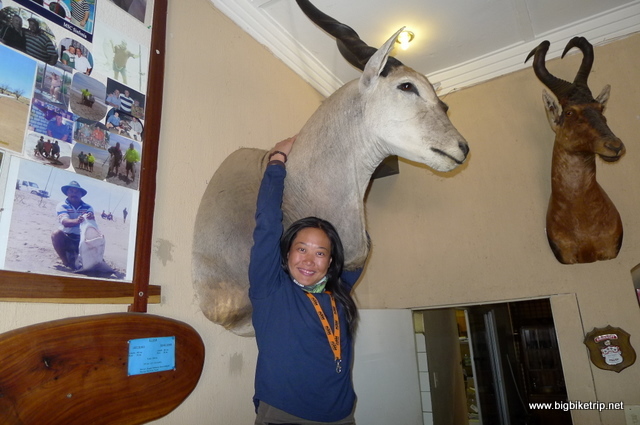 This entry was posted in Africa, Animals, Bikes, Elephant, Fanny, KTM, Lion, Mechanics, People, Route, Rupert, Uncategorized, Visas. Tagged 990 Adventure, bigbiketrip, Botswana, Chobe, Elephant, Fanny, kalahari, KTM, lilac breasted roller, Maun, off road, Okavango Delta, Old Bridge, Rupert, Safari, Zambezi. 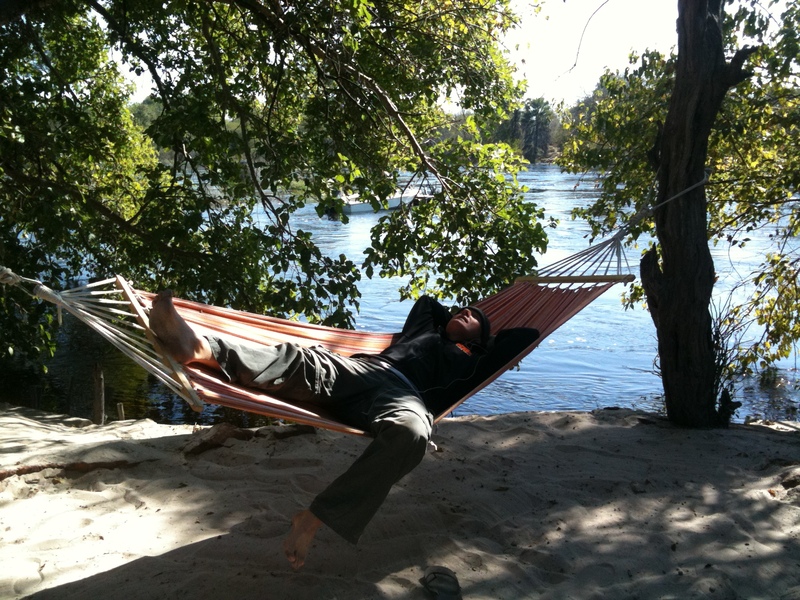 Previous Post Previous post: Chapter 1 – Part 2. Rupert & Fanny are on the way! Very informative. Looking forward to the chapter on Malawi., where I used to live. Started reading your RR just now, chapters 1 and 2 finished. Makes great reading, thanks for taking the trouble writing it!